2. 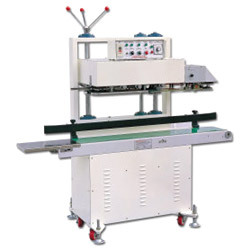 The unit can be equipped on a production line for continuous operation with an electronic counting device. 3. The sealing guide plate can be adjustable as desired. 4. Ideal for packaging films such as PE, PP, poly-film, Aluminum foil bags, moisture-proof cellophane, or other heat sealable films. 5. A knurling device is provided at the sealing area. 6. For sealing products such as sugar, feed, rice, corn and other heavy packaging. 1. Converyor size (LxW mm): 1450 x 200. 2. Width of sealing mouth: 10 or 12mm. 4. Dimension of goods (LxW): 150-400mm (L), 50-400mm (W). 5. Machine size (LxWxH mm): 1600 x 550 x1500. 6. Sealing speed: 8 or 10m/min.